Tested: 29 June 2011 - 4 Dec. 2011. I have this lamp on loan. 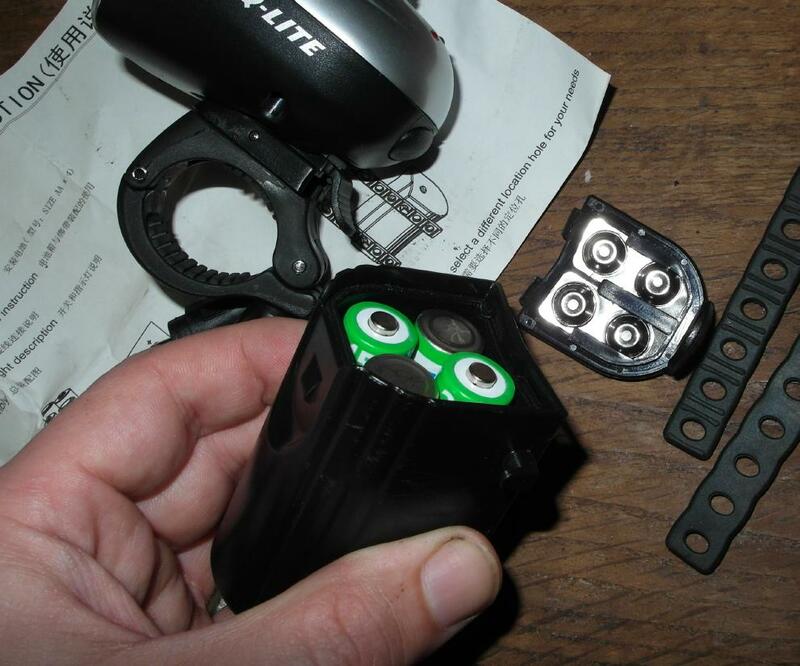 Possibly similar in performance to the Dosun D1 (though the LED seems to be driven at half the power of the D1). Size: Lamphead ca. 64 mm width, 57 mm height, 70 mm length. 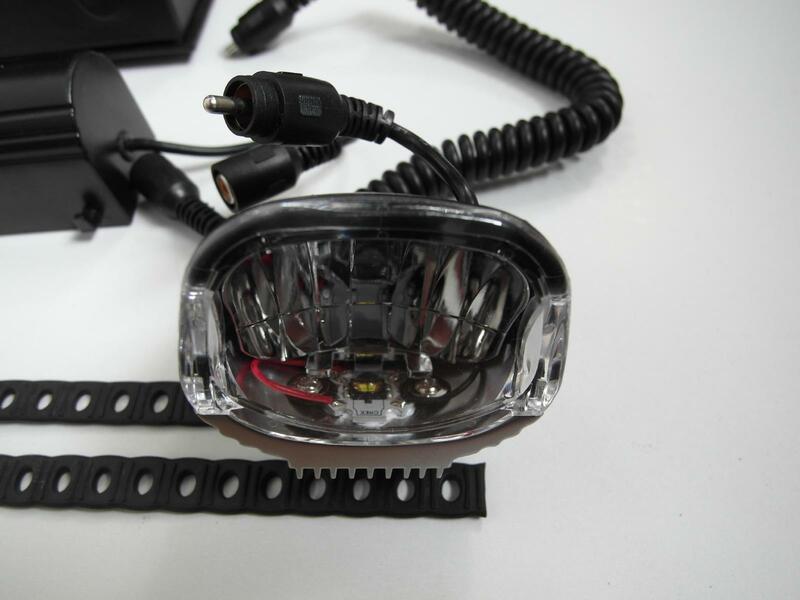 Housing: Aluminium top section which is also the LED cooler, plastic bottom section. 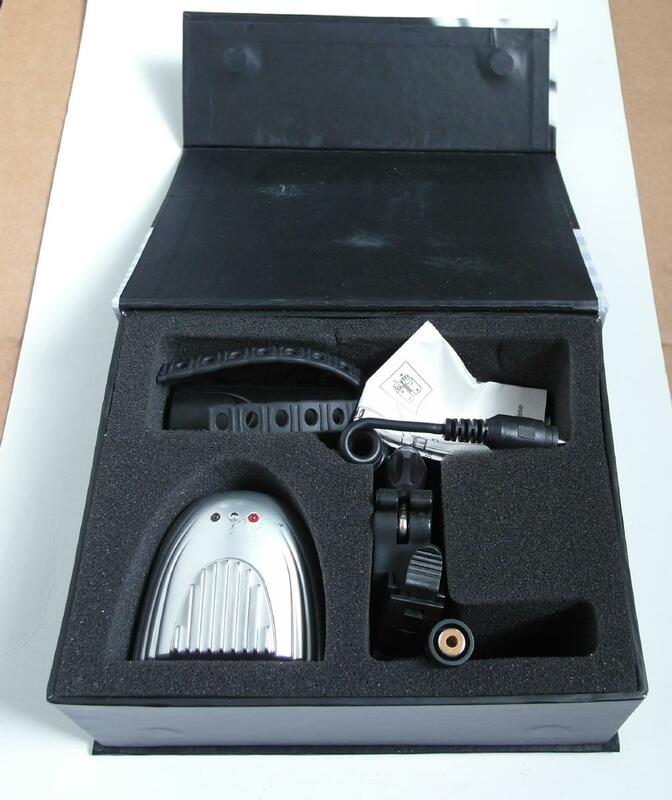 Light source: Cree MC-E, cool white. 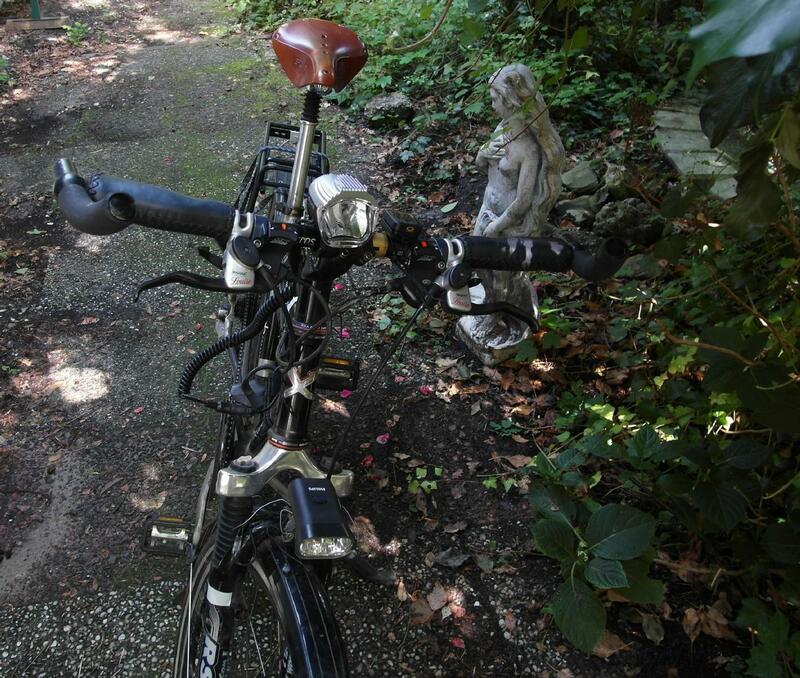 Mounting method: Quick release mount. Pressing the button on the back of the lamphead switches the lamp in low beam mode, another press goes into high beam mode, then it goes into low+high beam, then back into low beam etc. Pressing the button for just over a second switches the lamp off. It was dusk during my first ride. When switching the lamp on it seemed pretty good, lots of light. When I got to road 4 with lots of cars on the parallel road, the QL-269 was actually pretty bad compared to the Philips SLD dynamo lamp. No throw whatsoever (in that situation, because the lamp lights up the road at 35-40m pretty weakly you hardly even see it because of the lamps of cars shining in your face). 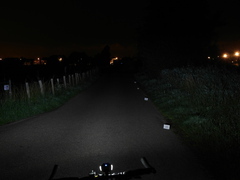 Second ride, to do some proper testing on road 1 (no streetlamps, without any traffic) and make beamshots and a video: Before riding off I put about 5 layers of white electrician's tape over the far-too-bright status LEDs. Much better! 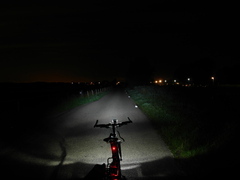 Then the problem with the high and low beam settings of the QL-269 became clear: If you point the high beam such that it doesn't shine into the eyes of oncoming traffic, the low beam only shines about 15m from your front wheel. Also, and much worse, is that the near field gets very much overexposed in that case so that you don't actually get to see far at all as your eyes adapt to the bright light near the front wheel. The only way I found that the low+high beam gave a useful total beam, was by pointing the lamp in a way that the low beam was shining as far as possible. This means the high beam was shining into the eyes of oncoming traffic quite a bit. 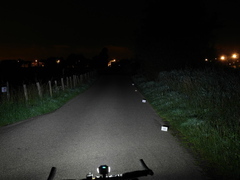 I will make some pictures of all situations on road 2, I now have beamshots from road 1 which isn't really flat, as the road goes up a bit with a bump in the road at 70 m. This also makes the beam look better at long distance in the pictures than it is. I would say even with the lamp pointing high, the near field is still overexposed because the brightness at longer distances looks better than I experience it while cycling. To come (at the LED). Low+high beam : ca. 2 h after which the driver goes in low mode, and the housing is noticeably cooler. In normal mode the housing gets pretty hot in my room test, but while riding even with 20°C it doesn't get warm at all. The lamp then continues running while the light gets dimmer and dimmer. I'd say after 3 hours total it's barely usable. Low beam: ca. 3 h ?? See the camera settings page for more on the setup and roads I use to make beamshots. 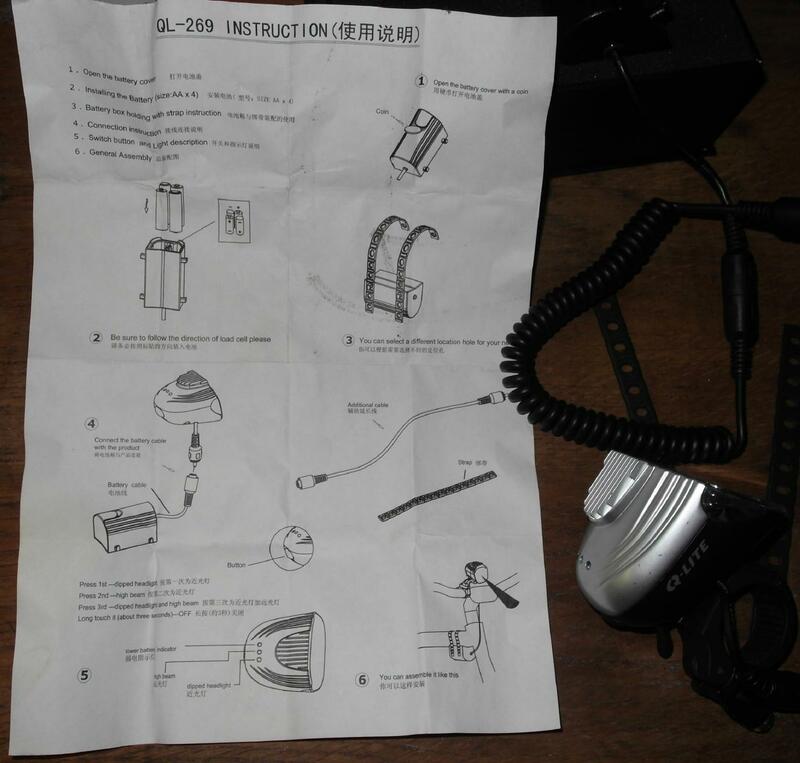 Video (night of 29-30 juni): Compares the QL-269 with the Philips SLD (dynamo). 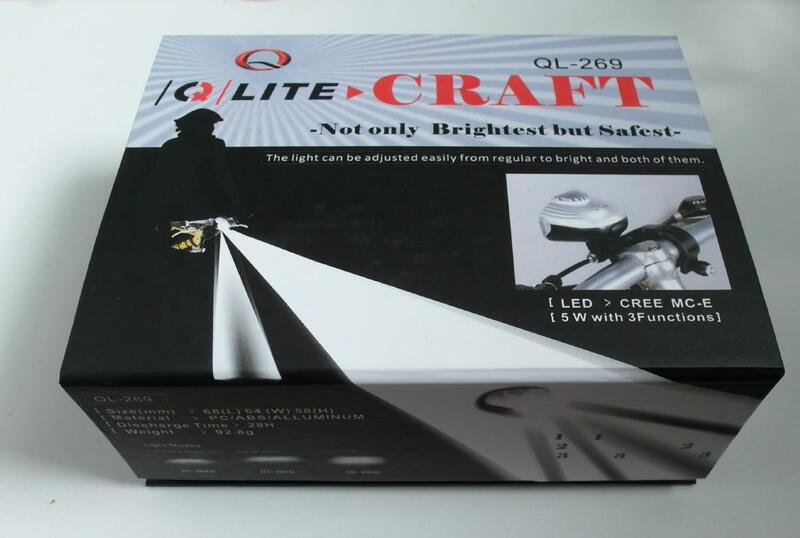 The low lux rating of 30-40 claimed by Q-lite means that little light is concentrated in the top section of the beam, which means throw isn't great and the results have confirmed this. Bad for throw is the overexposure of the near field that takes particularly place in the low+high beam setting. The beam is wide at the start which is good. 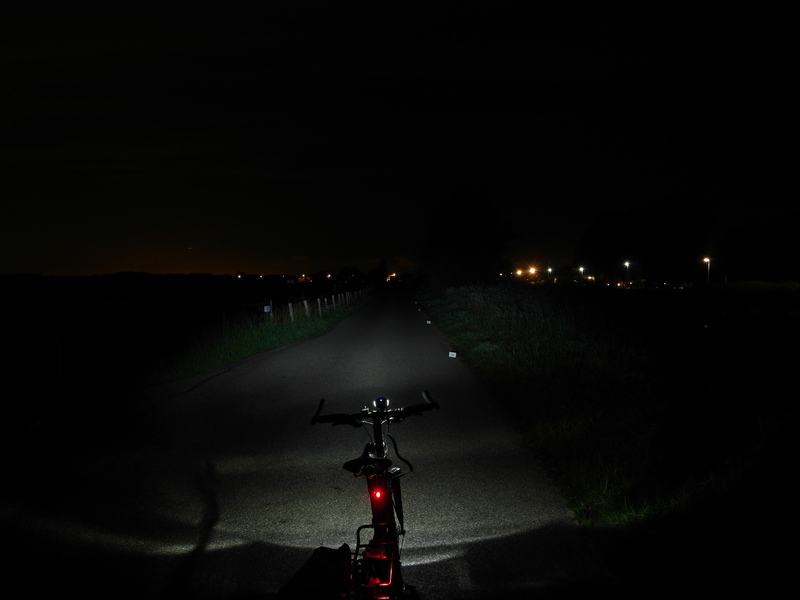 I did a direct comparison with the Philips Saferide 40: The QL-269's beam at 30-40m distance is pretty weak. 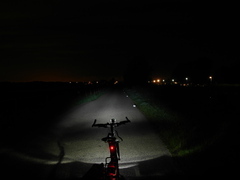 On a fully dark road you notice this less than on a road with some lighting and/or one next which lies a parallel road for cars which gives quite a bit of direct light from car headlamps into your eyes. 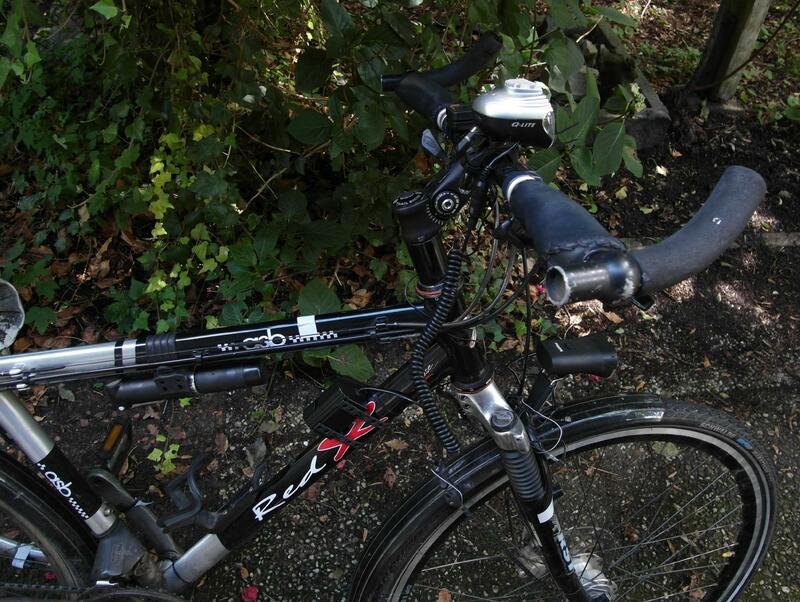 On these types of roads the Philips Saferide 40 is a lot better despite almost the same claimed lux value. 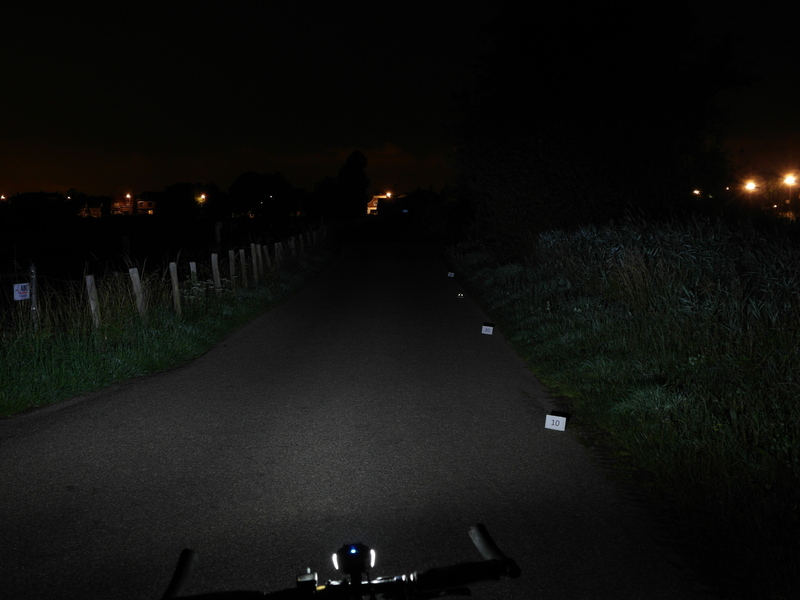 For people who ride at a more leisurely pace (say about 20 km/h at night), the QL-269 gives a very nice beam in low beam, and one that's better for that purpose, i.e. 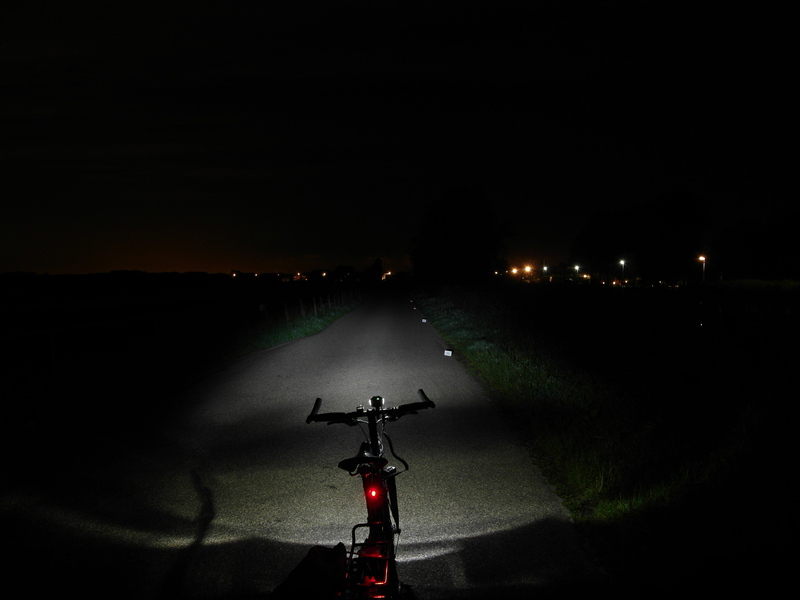 wider and brighter up to say 30 m distance, than dynamo headlamps such as the Edelux, Philips SLD, E3-pro-StVZO. 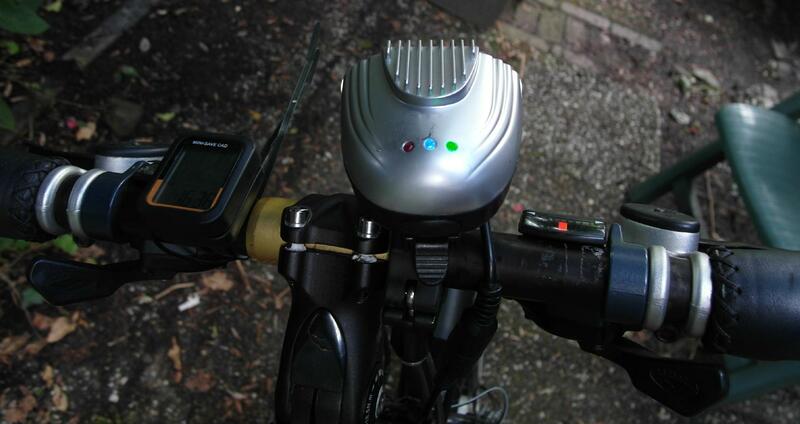 For people who like to ride fast (for whom 25 km/h is cruising) this is no competition to in particular the Philips LBL. I would even say that the dynamo powered Philips SLD (2.4W) and the Edelux (2.4W) are better lamps for fast riders. 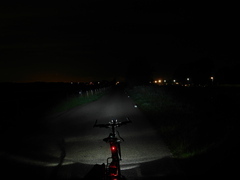 Problematic is the high beam: its cutoff is at a different position than the low beam, and to avoid really bad overexposure of the near field for the low+high beam you need to set it such that it blinds oncoming traffic (in the settings 'high' or 'low+high'). The high beam itself is useless in that case, it lights up the road very poorly compared to the low beam as you can see in the beamshots. I would not use the lamp in high beam mode as that's worse than the low beam. I also would not use it in low+high beam, as that adds almost nothing over the low beam. 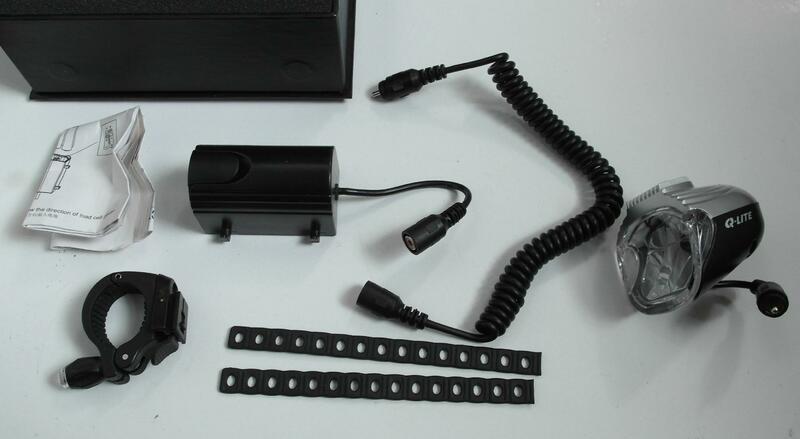 I think a simple improvement for the lamp (although very likely not StVZO compliant, as light above the cutoff would probably go above 2.0 lux) would be this: Instead of the low/high beam, just use the 2 cores as used in the low beam, and drive these at up to 0.70A instead of about 0.35A. This means ignoring the 2 cores for high beam! I wonder how much the designers were constrained in the design of the reflector by wanting to implement a high beam as it means the low, high and low+high beams all need to conform to the StVZO rules. Perhaps if they had used the 4 cores at all times, they could have designed the reflector better, such that it could make good use of 5W of the LED, i.e. by getting a higher lux rating. All in all this lamp is interesting in that it shows that more manufacturers are making beams with cutoff, but also interesting in the fact that as with all other LED headlamps it doesn't come close to the Philips LBL nor the B&M Big bang (Note: The Big bang's wide beam and its sharp cutoff are impressive on Vienna's beamshots I have to say, but the light colour and unevenness in the Big bang's beam are very unimpressive).